Announcing, Chefs And Their Spoons! You might wonder what three chefs talk about when they’re in a room together, amongst all the pig butchery and cooking and preserving suggestions that were inherent at the grand home butchering recently. Ellen pulled a spoon from her drawer to stir a brine and there it lay on the stove, calling out to chef Paul Fehribach. He admired it. Wished he could have such a beautiful spoon because it would be the perfect quenelling spoon. He said so out loud. And given that he’s a wonderful guy and that he’d spent all day voluntarily skinning her entire pig and that she’s super generous, she told him to take it. But he declined. No, that would disappear from the Big Jones kitchen. Just too nice and others would lust after its perfect quenelle-ish proportions. It would walk. “Use it at home”, Ellen insisted. That’s the sort of thing chefs talk about. In fact, a general conversation about spoons in all their glory ensued for easily ten minutes with Rob, Allie and Paul all swapping stories. Sort of the chefs’ holy grail, apparently. There’s a cook in one of their kitchens who spends his off days haunting antique shops and junk stores for spoons. Gets ’em cheap, but finds good ones. It was a fascinatingly long conversation. Who knew you could talk about spoons so long? Turns out chefs obsess over spoons. They know where they came from – “stolen” from kitchens they’ve worked in or maybe traded from another cook. They know what they’re good for, often serving one singular purpose on the line. And they know other chefs who are “spoon dorks” too. While visions of the perfectly shaped quenelle dance in Paul Fehribach’s head, a vision of an ongoing photo essay of Chefs And Their Spoons dances in mine! Rob Levitt is first up and I think I have a line on that junk-shop-haunting chef too, so stay tuned to see what your favorite chef has to say about spoons! Update: The next installment is now up! Click the Chefs And Their Spoons category to the right to see Rob Levitt And His Spoons. Following this story there was some pretty funny Twitter back and forth about spoons. If you missed it, here are a few highlights. 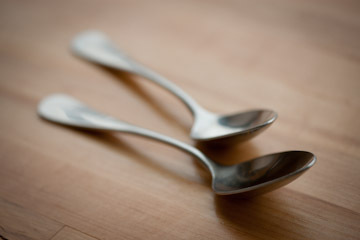 Mark Steuer to Ellen Malloy: did someone mess with my spoons? Ellen to Mark: No doubt on the spoon thing. Though I have the best spoons. Those are mine in the picture. Mark to Ellen: it’s funny, right? But my spoons will bodyslam your spoons. They are pretty though. Ellen to Mark: Oh yeah. Your spoons wear combat boots. Our spoons were sent to fat camp. Now we use sporks. Ellen responds: They are amazing spoons, to be sure. I make amazing quenelles. I can’t make out the brand mark, too small. Paul Fehribach jumps in: I’m coming back to your house with a magnifying glass, spoon detective! I have 2 spoons that are mixed in with the 10000 pc of silver we have. Inventory is coming & I’m hoping I get them back. The next installment of Chefs And Their Spoons is here: Rob Levitt And His Spoons. Spoons? I’d of thought knives. I prize my beautiful German and Japanese knives. Spoons?! Very cool feature. I have a spoon that, until recently, I did not realize was “mine” growing up. It has made dozens of moves and is the only utensil in the silverware drawer that isn’t a registry gift. If I lost it now, I would be crushed. I’ve bought over a dozen different spoons and I can’t find the perfect quenelle spoon. I was wondering if you knew where to get one, or would recommend any particularities in your “perfect” quenelle spoon. I work in pastry so having one is almost essential. Ah Karen, that is the holy-grail question! As you see from this post a fine quenelle spoon is highly coveted…and must be a matched pair, actually. I will post your question to chefs on my facebook and twitter pages in the hopes they’ll point you in the right direction. Yes spoons! Not all spoons are created equal, and when you need to spoon thousands of plates monthly – the perfect spoon (for the task) is irreplaceable!